Our driver will be waiting for you at the SJO Juan Santamaria Airport to take you to La Fortuna de San Carlos, Arenal Volcano area; you will spend 2 magical nights to start your holiday in Costa Rica. This transport takes about 2.5 hours. After checked into the Hotel, you can enjoy the resort facilities or simply relax in your room. After stayed the first night in La Fortuna, we shall start the day with a delicious breakfast at the hotel, for getting energy that will be needed for a busy day. First, we will pick you at the hotel in the morning to take you to the Ecological Park Arenal Mundo Aventura, where we will Ride to La Fortuna Waterfall, we will be back to the hotel at noon. Then, in the afternoon, we will pick you up again at the hotel; this time is to take you to the Arenal Volcano National Park, where you can admire the beauty of this Colossus. At night, we are going to visit Baldi Hot Springs, where you will enjoy a Resort with 25 pools and a delicious dinner. Right after enjoying breakfast at the hotel. We will pick you up at the hotel to take you to the beautiful beach in Guanacaste, there; you will stay in a hotel for 3 nights for sunbathing and visiting the Pacific side of Costa Rica. 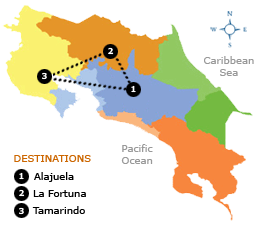 This transfer takes about 3.5 hours from your hotel in La Fortuna to your new hotel in Tamarindo. This day is entirely yours, enjoy Breakfast at the Hotel and then go to sunbathe on the the beautiful Tamarindo beach. By the way, there are many activities to do in the area, such as: Surfing, Snorkeling, Fishing, Scuba Diving, Boating or ATV. Sleep late, rest and relax... you are in your Holidays, go breakfast at the hotel and enjoying the facilities as you deserve. Admire your last sunrise in Guanacaste, enjoy the last holiday breakfast facing the sea. We will pick you up in the afternoon to take you to San Jose, where you will stay the last night before taking off; the hotel is just minutes away from Juan Santamaria Airport, so you can sleep peacefully. Enjoy your breakfast at the hotel; then, when you get ready to leave, ask for transportation in front desk to take you to the airport. Remember; you are going to be just minutes away from the airport. • Hotels in La Fortuna: Montana de Fuego (Bungalow) - Los Lagos (Standard) - Magic Mountain (Standard). • Check in time at the hotels: 2:00 pm / Check out: 12:00 m.d.